Reading ads from IT companies is always interesting. When a company grows big or the company is already a big player in the field, marketing and PR work in many occassions turns to be quite important, just like how a company emphasizes on outstanding product development during its early age. Recently, I was so busy with my projects and hardly found time to read latest news or info from my mag and journal subscription. 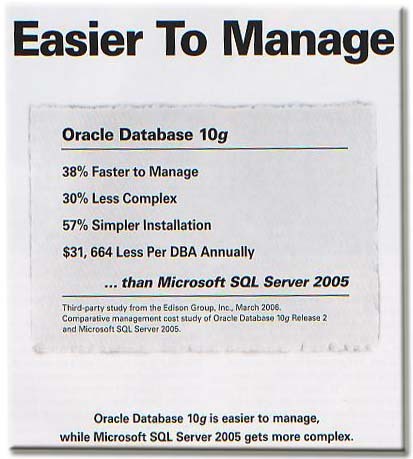 Surprisingly, in this May/June edition of Oracle Magazine which I just read, I found this very interesting ad in one page of the magazine. Hilarious!! This is not an ordinary ad. This is a direct-confrontation wrapped in a sweet ad candy. I don’t know other parties’s reaction, but it will be fascin-IT-ing to see how IBM or Microsoft responds to this challenge. Big companies always have their own creative mind. This entry was posted in Database, Miscellaneous on July 25, 2007 by Tech Admin.